As is the case with medical devices, automotive systems, manufacturing equipment and various other sectors, the aviation industry is increasingly relying on software. Since aircrafts and avionics systems are prime examples of safety-critical equipment, it is no surprise that this rapid increase in the use of software in all kinds of airborne equipment has led to the creation of rigorous standards to assess the airworthiness (safety and quality) of these systems. The rigorous requirements of Federal Aviation Administration (FAA) and European Aviation Safety Agency (EASA) regulations require developers to use adequate processes in their development lifecycles, and also provide a means (guidance) for manufacturers to meet the Technical Standard Orders (TSO) requirements for certification. The set of requirements known as DO-178C (RTCA DO-178C or EUROCAE ED-12C) is the most widely used standard in aviation/avionics development. It's not prescriptive in nature, meaning that it specifies certain objectives that need to be attained, but doesn't define a single process to reach those goals. Rather, it contains activities that help developers satisfy the standard's requirements, and also descriptions of lifecycle data that could help prove compliance. Therefore, it gives these companies the flexibility of adopting alternative processes, as long as they ensure and provide a means to prove the airworthiness of the end product. DO-178C requires its users to conduct a system safety assessment process to determine and categorize all the possible failure conditions of the system(s) they are working on. These will be used to derive safety-related requirements (functional, integrity, reliability, design). Then, users need to assess the extent to which software could contribute to these failure modes, determining the so-called software safety levels. 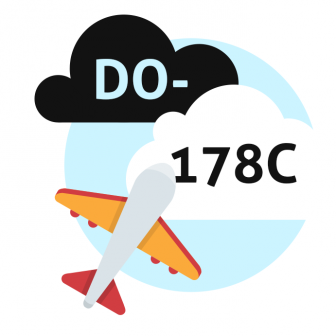 These safety levels then help understand how strictly one needs to stick to the requirements of DO-178C. DO-178C is a complicated set of requirements – then again, it's probably for the best, as flying definitely has its inherent risks. Therefore, avionics development companies are facing a challenge when trying to achieve and verify compliance with this standard. Defining and enforcing the use of adequate safety processes, ensuring traceability, and maintaining clear documentation are greatly facilitated by the use of codeBeamer ALM, and Intland’s Avionics DO-178C & DO-254 Template. This template has been configured for avionics lifecycles, and contains all the objectives of DO-178C, as well as preconfigured, but flexibly customizable trackers and workflows (approval processes with e-signatures can also be configured). Due to its flexibility, codeBeamer ALM can be configured to support compliance with further standards, with out of the box support for DO-178C. This template lets you manage aviation-specific requirements, establish associations between all work items, and also provides a convenient way to ensure the visibility of all processes. QA & Testing activities may be simply managed using Intland’s Avionics DO-178C & DO-254 Template, as it allows you to define test cases, execute test sets (even automatically via Jenkins), re-use test sets from a library, analyze test coverage, and export reports on test results. Interested in finding out more? Fill in the form below to request Intland's Avionics DO-178C & DO-254 Template, or contact us with your questions!